Head of the Party Central Committee’s Mass Mobilisation Commission Truong Thi Mai has assured President of the Communist Party of Bangladesh (CPB) Mujahidul Islam Selim that the Party, government and people of Vietnam always treasure friendship with the CPB. During a reception in Hanoi on June 19, Mai said the Communist Party of Vietnam (CPV) wishes to further reinforce the friendship and solidarity between the two Parties, contributing to strengthening ties between Vietnam and Bangladesh for the benefit of the two peoples, and for peace, stability, cooperation and development in the region and the world. Islam Selim, for his part, hailed the achievements gained during the renovation process led by the CPV over the past more than three decades. He expressed his wish to strengthen ties with the CPV, especially in the sharing of information and experience in Party building. 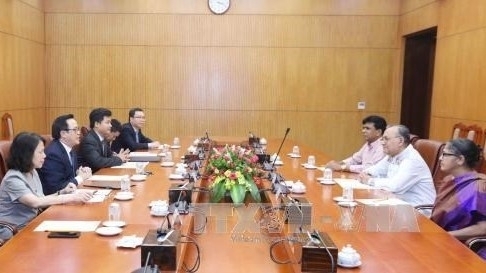 The guest also held talks with head of the Party Central Committee’s Commission for External Relations Hoang Binh Quan, during which, both sides briefed each other on the respective socio-economic performance and discussed specific measures to boost ties between the two Parties and countries. As scheduled, the Bangladeshi leader will hold working sessions with leaders of the Dien Bien provincial Party Committee and the Ho Chi Minh City Party Committee, visit several economic and cultural establishments.